The second in the series of paintings inspired by the presence of animals in different religions and myths of the world. 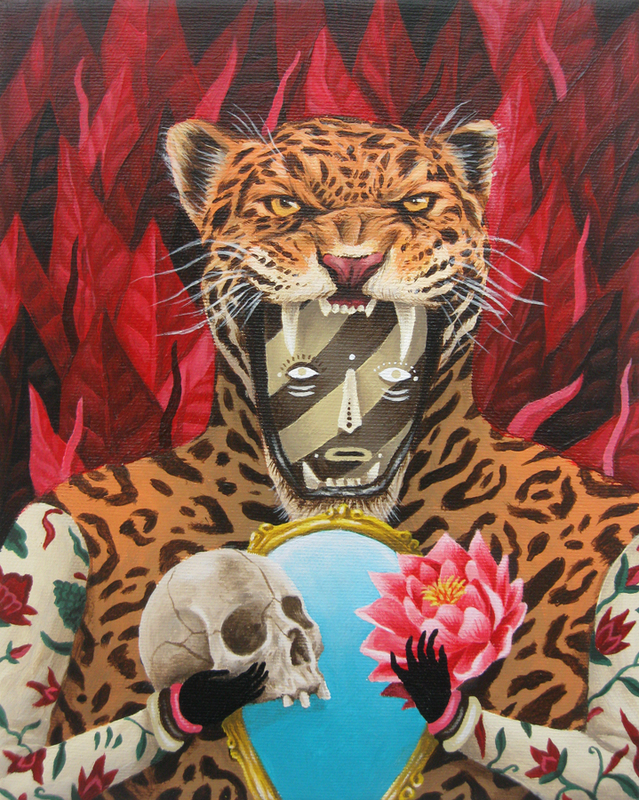 This character is some sort of god / shaman, part jaguar, part human, a mix of different features of deities from Central and South America: Tezcatlipoca, a god in Aztec religion, associated with jaguars, and who is sometimes called Nahuatl "Smoking Mirror", mirrors being often used in shamanic rituals; in Olmec religion jaguars were an important part in shamanic rituals, with the role of protecting the shamans from evil spirits during their movement between earth and the spirit world, so the jaguar has this character of duality, being able to adapt to both the trees and the water, the nighttime and the daytime, the earth and the world of spirits; in Mayan religion the jaguar also has this character of dominating both the day, the world of the living, and the night, the world of the spirits of the dead. Because of the connection between the underworld and vegetation, most of Maya's sources of water being originated in underground pools, the jaguar is also seen as a god of fertility. So my character is a mix of human and jaguar features, he's surrounded by vegetation, and holds these objects: the mirror, part of the shamanic ritual, it's some sort of door to another world, the skull obviously symbolizes the world of the dead, and the water lily symbolizes fertility, the world of the living.